The weather might be taking a turn for the worst, but there's no reason why it should stop you from walking your dog. Not only is regular walking important for staying fit and healthy but it's a great way of exploring, interacting with others, and relieving some of your energy and stress. Whether it’s a trip to the beach, a walk through woodland or a ramble over open fields, now is a wonderful time to be out exploring! Maybe you already have a favourite route in mind or are looking to discover new ones; whatever the case, the UK has so much to offer and a great dog-walking trail could be right around the corner! In this article we are sharing some of the UK’s most popular dog walks (and urging you to share your personal favourites too!) so please have a read and get in touch if you’ve visited any of these exciting sites. Beaulieu Road, Brockenhurst, Hampshire, SO42. Nestled amongst the glorious forests of Brockenhurst is Dibden Inclosure – a popular dog walking route teeming with appeal. The trail is long without being arduous and is wonderfully varied with hills, flat walks, forests and streams, as well as beautiful wildlife and glimpses of the wild New Forest ponies. For dogs that love open spaces, varied terrain and getting their paws wet, Dibden Inclosure is a great choice for a fun-filled day out. Because the paths are well defined, there is no need to get your feet dirty, unless, of course, you want to stray off the beaten track and do some exploring. While Dibden Inclosure offers an off-lead area for your dogs to make the most of, it goes without saying that dogs should always be kept on-lead around horses - after all, the forest is their home. Come rain or shine, Dibden Inclosure is a great place for you and your dogs to have an adventure, and you may well find yourself returning time and again! 3 Weston Road, Burnham-on-Sea, Somerset, TA8. If your dog loves the sea, then Brean Beach offers the perfect place for a brisk stroll. The beach is open year-round, so there’s no need to limit your walks to just the season. Covering 3 miles of sandy seafront and surrounded by countryside, Brean offers beautiful views and a generous stretch of beach to charge along and discover. (When walking along the clifftop, keep your dogs on leads to avoid accidents. Every year, dogs are wounded and killed in falls because they are off-lead). Brean Beach is a great location for families too, with its many picnic areas and refreshment stands. There is also an amusement park nearby, as well as dog-friendly pubs and campsites. Why not make a weekend of it and hitch a tent nearby? If you want to go for a walk when the beach is a bit quieter, go at dawn and catch the sunrise over the water. This is a great time for exploring the sand dunes with your dogs and allowing for a brisk (but peaceful) morning swim. Don’t forget your beach towels! Darwen, Blackburn with Darwen, Lancashire, BB3 OPA. For dogs that prefer being off-lead when sniffing out the countryside, Roddlesworth Reservoirs is the ideal location for some free range exploration (although, be mindful - there are still designated 'on-lead' areas). The route is 3.3 miles and incorporates forest trails, rivers and well-defined footpaths. You'd be hard-pressed to find a better dog walk in the area! With plenty to see and do, including a country pub and a dog-friendly cafe for that leisurely re-fuel, Roddlesworth Reservoirs and Tockholes Plantation is a great place for a spring outing with all the family. If the weather is particularly nice, why not take a picnic and make the most of the sunshine! Have your towels at the ready because this trail offers ample opportunity for your dogs to get their paws wet and have a splash in the Plantation's crystal streams. Take the route at your own pace and enjoy the vibrant scenery that comes at you from every angle. Pyrand's Lane, Southampton, Hampshire, SO31. 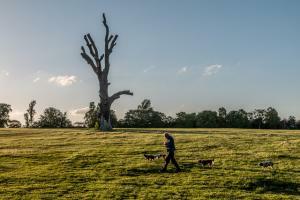 Whatever your walking preferences, Manor Farm Country Park is a route that offers everything. From peaceful woodland and riverside, to abundant open space for free range play - you are guaranteed a great day out! Combining hills, flat walks, forests and streams, as well as a nearby farm which is open to the public, there is something for dogs, adults and children alike. Pack a picnic or pay a visit to the farm cafe for a bite to eat and to rest your weary legs. Give your dogs a run-out in the park's off-lead areas or pass time with a fun-filled game of fetch. Equestrians are also catered for at Manor Farm with its scenic bridleways and open areas. During the summer, ice cream kiosks open up along the trail for a cool refreshment en-route. Invite your friends and make the most of this stunning setting. Grace Dieu Wood, Coalville, Leicestershire, LE67. One of the UK's most historic routes takes you through Grace Dieu Woods and down towards Grace Dieu Priory - believed to be one of the most haunted places in Leicestershire. Not a walk for the faint-hearted, follow the signposted trail through pleasant woodland, beneath the railway line and on towards the priory's ancient ruins. Don't be put off by tales of the prioress' ghost, however, as the Grace Dieu Woods offers a fantastic spot for some wistful wandering over mostly level ground. The forest walk is a great place for letting your dogs off-lead and enjoying some shade when the weather starts hotting up. Your dogs will love the freedom to run and play amongst the trees and get their paws mucky. If you are feeling brave, take a picnic and spread out beside the priory or have a stroll around its ruins. Not a long walk, but certainly one you'll remember and, quite possibly, revisit. couldn`t agree more The coastal path is just stunning Why go abroad! OK Lovely walks but only 5 minutes away from Dartmoor what moor can I say! Hatfield Forest, near Takely, Essex. Great for dog walking. National Trust so take your membership card or pay Â£5 entry, cafÃ©,loos and den building for children. Casper loves a run at Brean, and he loves fish and chips on the way home if we don't take a picnic with us. He also loves exploring the Quantock hills.